Today’s professional filmmakers have the resources available to shoot high-quality video that can stand side-by-side with some of the material being produced by major studios. This is all thanks to a surge in availability of top-of-the-line camera equipment at a reasonable price tag. At the forefront of this movement is Blackmagic Design, which has released a number of filmmaking production equipment that can greatly enhance the video capture and editing processes. Blackmagic cameras are capable of shooting raw, uncompressed video, allowing for more dynamic transfers. Because this hardware comes at a lower cost than traditional production equipment, independent filmmakers and other media professionals can level the playing field with their larger and more well-funded competitors. Clinton Stark highlighted one such example of exemplary filmmaking done on Blackmagic cameras, lauding the work done in a recent short “Prospect.” Funding was a major issue for the creators of the movie, Zeek Earl and Christopher Caldwell, forcing them to turn to Kickstarter to get the financial backing needed to shoot the film. Premiering at SXSW, the movie is now available to watch on Vimeo. Stark explained that by shooting on Blackmagic cameras, the duo was able to achieve a professional quality that is often lacking in independent work. Blackmagic Cinema Cameras were given a similarly glowing appraisal in a recent review written by Bob Kovacs for Government Video. Kovacs championed the hardware, describing his time with the camera as an “eye-opening experience.” However, Kovacs did note that he had some difficulty getting his solid state drive formatted to work properly with the camera. 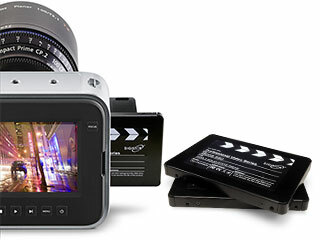 Blackmagic cameras require the SSD drive to be formatted in a certain way in order for it to be recognized by the camera. Nearly all SSDs on the market come with no format on the drive at all, potentially requiring the user to seek out additional software resources and scour the internet for methods on how to format the drive properly. Some individuals may have to purchase a new SSD if they find their drive isn’t compatible with the Blackmagic camera. That could be an arduous and time-consuming process that requires more technical know-how than the average video professional may possess. A viable alternative to this issue is to get an SSD that is properly configured for Blackmagic use from the outset. DIGISTOR’s Professional Video Series SSD Drives are specifically designed from the ground-up to work with Blackmagic hardware, ensuring that users avoid any setup-related headaches. This compatibility includes Blackmagic’s 4K offerings, which provide unparalleled uncompressed video capture abilities. By incorporating a DIGISTOR SSD, video media professionals such as filmmakers and videographers can get their new, peerless production equipment up and running without delay and begin shooting high-quality content.